"اردینتسوگ" (T. Eredenetsogt) یکی از چهره های معاصر و مطرح شعر امروز مغولستان است. او متولد 1972 و ساکن ایرلند است. Persia, end of 15th century. 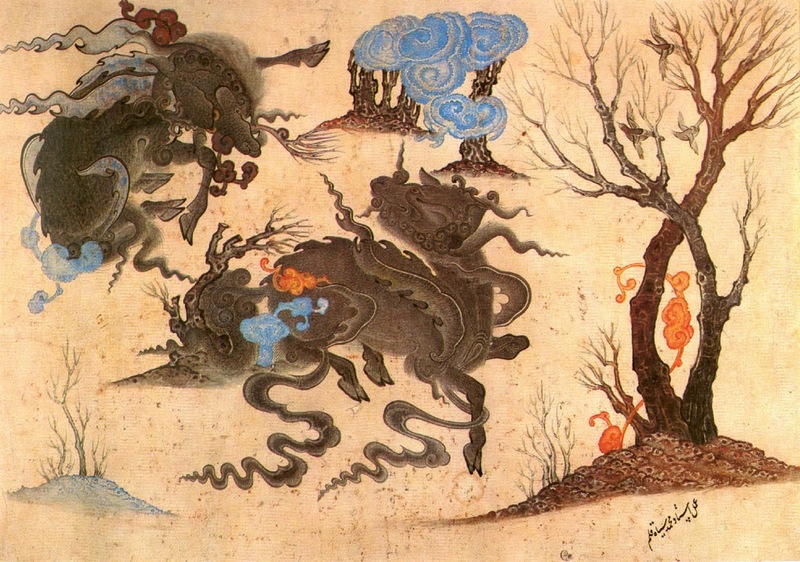 The Chinese dynasties had a dominant effect on Mongol and East Turkestan painting. The effect was brought to Western Asia by Mongols and Persians. During the time of Timur, the relations between Turcomans and the Ming Court were concrete. Under Shah Rukh relations with China became more cordial, however the Ming returned to neo Confucian practice and the traditional tributary relations and the gift exchange with the hope of making a good Muslim out of Ming stopped. In any case, the overland trade between China and Central Asia stayed steady. The effects of the Chinese and Central Asian artistic style became dominant in early 1400s. The miniatures depicted in this page are attributed to Mehmed Siyah Qalem and other Siyah Qalem (or Mohammad Siyah Kalem) school painters.